For freshman Jake Tomsik, playing lacrosse at the collegiate level has been a lifelong dream. 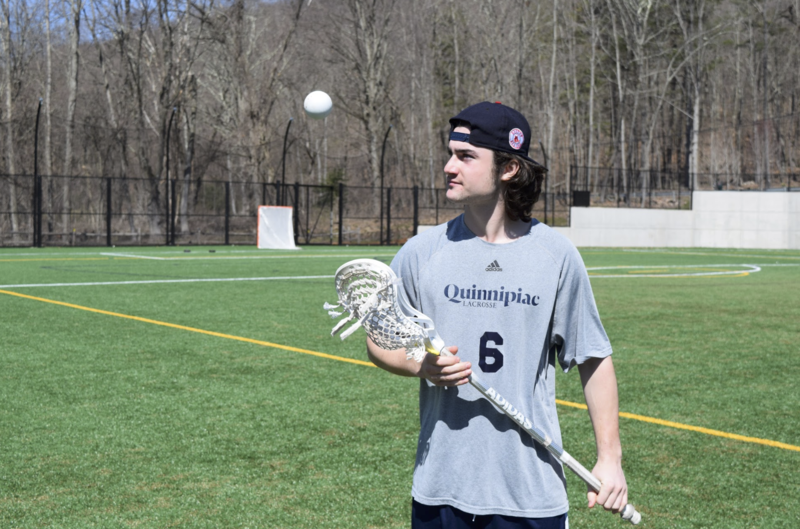 Despite having grown up without a lacrosse team in his hometown of Medway, Massachusetts, he’s been dominating the Quinnipiac field and the record books all at once. Q: When did you first start playing lacrosse? A: I first started playing in like third or fourth grade. I played town lacrosse. It’s actually funny, the town I live in Massachusetts. When I was growing up, they didn’t have a lacrosse program, so I didn’t think I was going to be able to play but we knew the director of a lacrosse program from a couple towns over. Since we knew him, I got to play there and they were really good. I had a lot of good coaching growing up and it just worked out perfectly like that. Q: Can you think of anyone that influenced your playing or inspired you? Q: You mentioned playing hockey and lacrosse, but did you play the two together really competitively throughout high school? A: Yes, I did, my whole life growing up. I started with hockey because my dad played hockey like I said, and my mom was a figure skater, so skating was just in my blood. And I started playing hockey when I was three, and that’s what lead me to lacrosse where all the kids on my team were starting to play lacrosse. It was this new sport, and I was like, “Dad, I want to play,” and so that’s how I started playing lacrosse. A: My dad was so good about it, same with my mom. They were so supportive. It gradually happened because hockey I was playing for so long that is was my favorite sport up until like sixth or seventh grade. At that point, I knew I was just better at lacrosse and be able to do bigger things with lacrosse. That’s when I said, “Yeah, lacrosse is my favorite over hockey.” I’m sure it hurt my dad and my mom a little bit, but they love coming to my lacrosse games now. They’re at every game. Q: What was it like meeting Coach Fekete and your future teammates? A: Well when I visited, it was Coach Fekete, Coach Poli and Coach Tulli. Now, we have a new offensive coordinator coach [Zomerfeld] instead of Tulli, so it’s a little weird that when I visited the same coaches aren’t here. But it worked out perfectly because Coach Zomb is awesome, and same with Coach Poli and Coach Fekete. I felt a connection with them. It’s all great. As for teammates, I really didn’t know the atmosphere and I didn’t meet any of the guys until I stepped on campus the first day, so I really had no idea what to expect. But like I said, it just worked out so perfectly and I love all the guys on the team. It was weird because I was supposed to have an official visit like all the other recruits have, but something happened with the scheduling so I never got to go visit. But it never influenced or changed my decision, I was pretty heavy set on Quinnipiac. A: Criminal justice. I didn’t want to go into business; it’s too boring and everyone does it. I want to go into the FBI or the DEA or something like that and become an agent. That’s what I want to do. Q: Now that you’ve settled in for a semester and a half, what was it like coming to this new team at first? A: It was super easy, honestly. All the guys on the team are great, from day one they’ve been super, upperclassmen they gotta give you a hard time, but at the same time super supportive, and super nice, just a perfect mix of upperclassmen leadership. They’re there to tell us too when we’re doing something wrong and help us get better, they’ve been great. Q: Did you ever feel like this was all too intense or the wrong decision? A: That can go both ways. Part of me wants to say that I’ve been waiting for this my whole life. I’ve been expecting this, growing since my freshman year, getting recruited and going to D1 prep camps. The other part of me wants to say when I wake up, “why do I do this.” It’s a long day ahead, but I’ve been ready for it. Q: Did you set any goals before you came here? Did you have a particular mindset coming to school? A: I wanted to be MAAC rookie of the year, and I want to win four MAAC championships while I’m here. I have a bunch of goals and I talked about them with all the other freshman, so we’re all on the same page. I’ve talked about it with the coaches, too. I had a goal of how many points I wanted this year and I already passed that, so I’m really happy about that. Really, it’s all been working out great. Q: How would you describe your playing style? A: That’s tough because I’ve played with a lot of really, really good players and all of them play differently so it’s a mix. I’ve played with kids like Ryder Garnsey, who goes to Notre Dame and is their starting attackmen. He has so much flare, always one hand on the stick, like Foster Cuomo on our team, where they play and you can’t take your eyes off of them. But then there are guys like Mike Fletcher on our team, where they’re not flashy but they get the job done and put up points. So, I try to mix that in there with being myself and staying creative and doing fun things, but also keeping the coaches happy, sticking to the game plan and playing to my role. Q: If you could give one piece of advice to the next freshmen coming in what would you say? A: I’d probably tell them to have the most meal plan points as possible. But really, time management because I focused on that a lot in high school. Getting ready to come here, that’s huge but it’s also something you have to be able to do on your own. Q: How do you hope to influence this program and all the players that come? A: I just have to stay hungry on the field. Staying competitive, not becoming complacent with being just a MAAC team. We want to win the MAAC every single year and get that automatic bid to the tourney, and just keep going and keep building the program up and up.